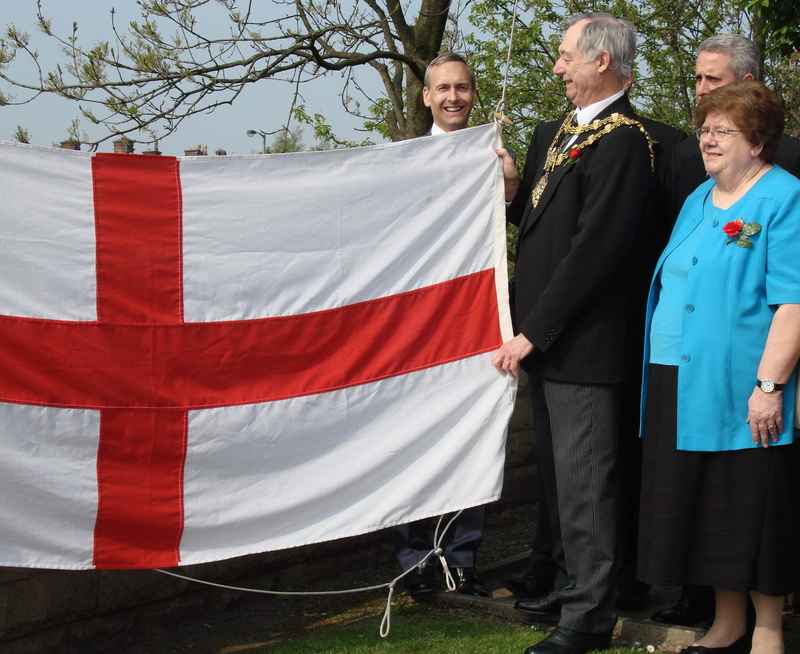 As St. George’s Day falls during the Easter Holiday weekend this year the Civic Flag Raising ceremony took place on Thursday 21st April. I attended along with the Mayor of Bury the Deputy Mayor, Mr Ivan Lewis the MP for Bury South, Cllr Bob Bibby the Council Leader and Cllr Yvonne Creswell the Deputy Leader. Prior to the flag raising ceremony the Rector of Bury Reverend John Findon gave a brief talk on the history of St. George and said prayers. 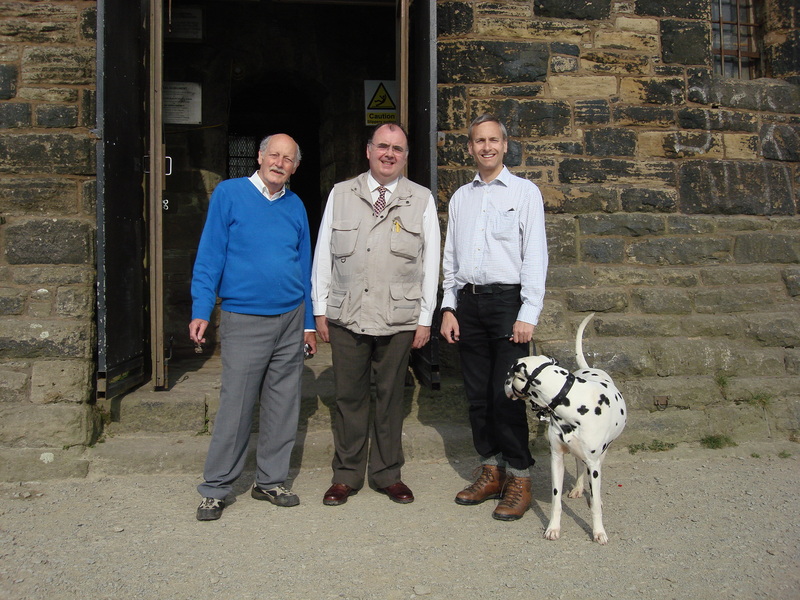 This morning St George’s day itself I took CeeCee up Holcombe Hill where Councillor Barry Theckston and Bryan Farlow had arranged to ensure the Cross of St. George was flying proudly from the top of Peel Tower. 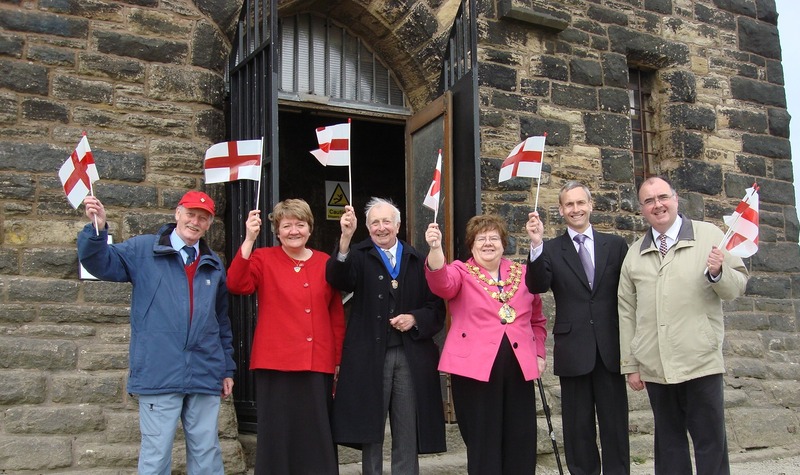 I attended the Civic Flag raising ceremony outside the Town Hall at 9 am then made my way up (on foot I hasten to add) to he top of Holcombe Hill to join Councillor Theckston from Ramsbottom who has for a number of years been arranging for the Cross of St. George flag to fly from the top of Peel Tower each St.George’s Day. We were later joined by the Mayor and Deputy Mayor. I climbed to the top of the Tower and the view as ever was spectacular. Then it was back to campaigning and after speaking briefly to the congregation following Friday prayers at a couple of the Mosques in Bury I caught him with a few more phone calls and emails. In the evening I visited two more of the local Conservative Clubs to have a word with the members and visitors. I have attended the Special Meeting of Bury Council this evening when the Council Tax for next year was set. The increase for the Bury Council share will be 3.39%. Once the increases from the police and fire authorities are added the increase will be 3.75%. The ruling Conservative Group could have tried to use creative accounting to keep the Council Tax increase artificially low but despite looming local elections and the pending General Election Councillors have rejected the temptation to have a budget full of gimmicks and populist measures. The meeting this evening demonstrated how politics is all about competing choices. Both opposition groups proposed amendments which their supporters would approve of but in the end politics is all about difficult choices and inevitably it is the Party in control that has to take those decisions. Last night I attended an Eid Party organised by the Muslim Friends of the Conservatives held at the Radcliffe Civic Centre. The event was well supported with, I am told, over 400 people in attendance. The principal guest speaker was Saj Karim MEP and there were several other speakers including myself. 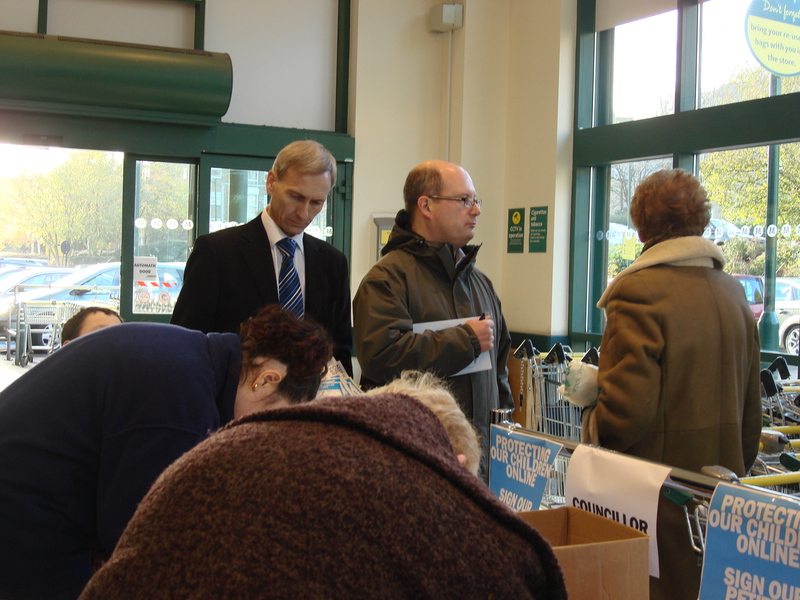 In addition to the Council Leader Councillor Bob Bibby several other local Councillors also attended. I spoke about the importance of faith and the Conservative principal of trusting the people. Today, in addition to dealing with various emails and items of correspondence I have been out helping to deliver our latest Conservative newsletter. Yesterday afternoon I attended the Annual Council Meeting when after the formal business had been concluded Ramsbottom Councillor Sheila Magnall was installed as the new Mayor of Bury. Councillor Magnall takes over from Moorside Ward Councillor Peter Ashworth who now becomes the Deputy Mayor. In the evening Sue and I attended the Archdeacon’s Visitation service held at St.Peter’s Church in Bury where I was formally admitted as one of the two Churchwardens for St. Anne’s Tottington.